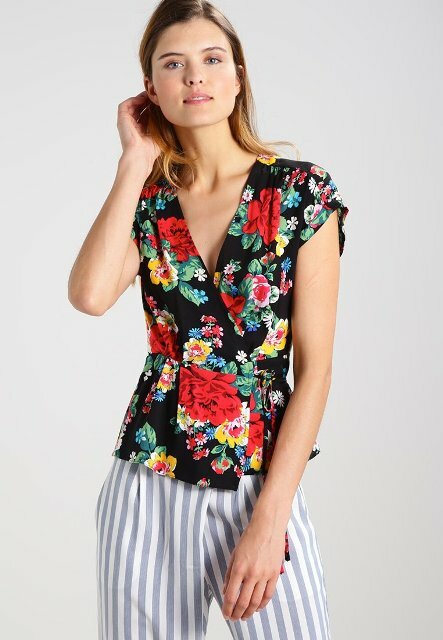 We have already told you that a floral print is one of the best prints for spring and summer outfits. 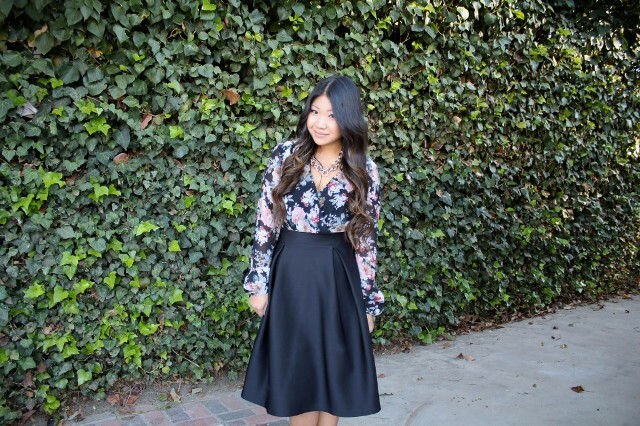 So today we would like to continue sharing with you feminine and gorgeous floral items. 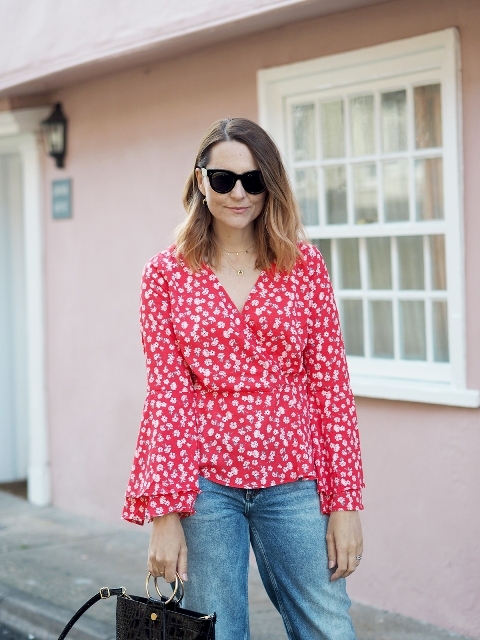 It’s time for floral printed wrapped blouses! 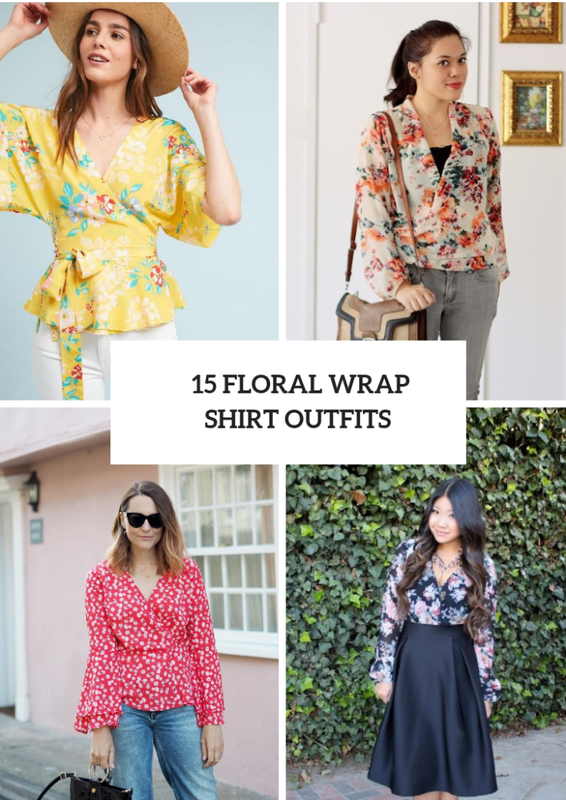 They always look fresh and stylish, and you can add them to any styled outfits. All you need is to pick up a shirt with an image of your favorite flower from elegant roses to funny daisies. And, of course, don’t forget to choose a color combination depending on your wishes. Right now I offer you to look below and find an inspiration! 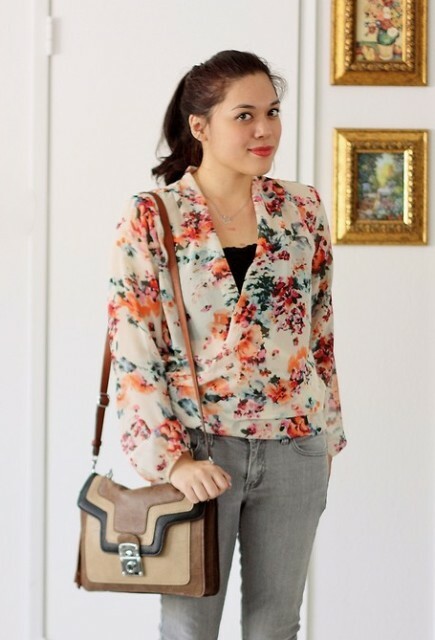 It is very easy to create a cool and comfy outfit with jeans and a wrapped shirt. So you can follow some examples. 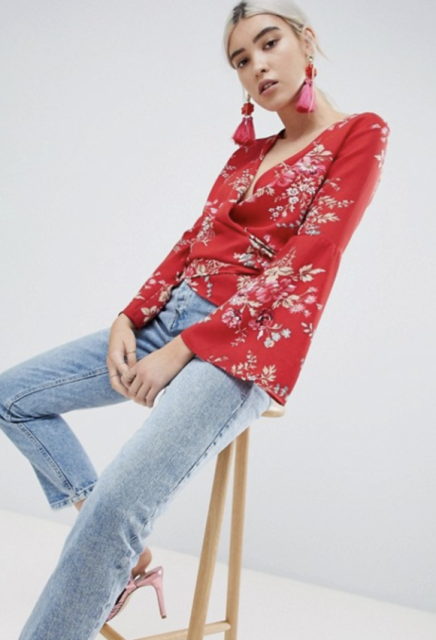 First of all, you can take a red wrapped long blouse with white tiny flowers and pair it with oversized sunglasses, straight jeans and a black leather bag. 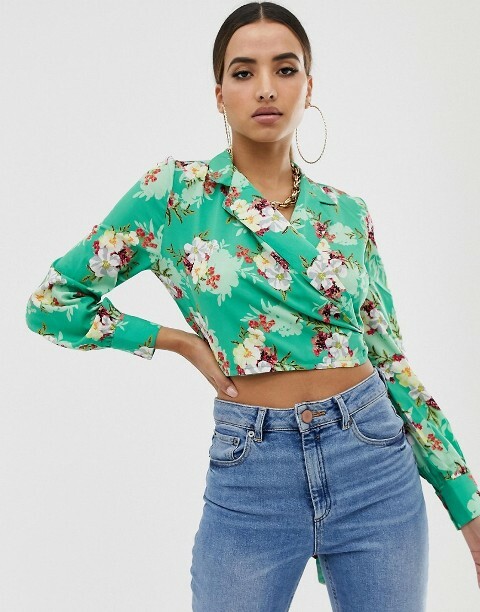 Secondly, you can try to repeat a look with a green and white floral long sleeved crop shirt and high-waisted jeans. 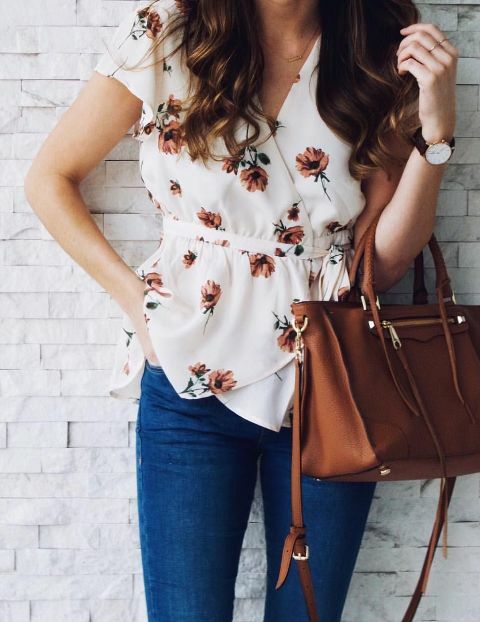 Thirdly, you can choose a floral loose blouse and combine it with a black top, gray jeans and a three colored leather bag. 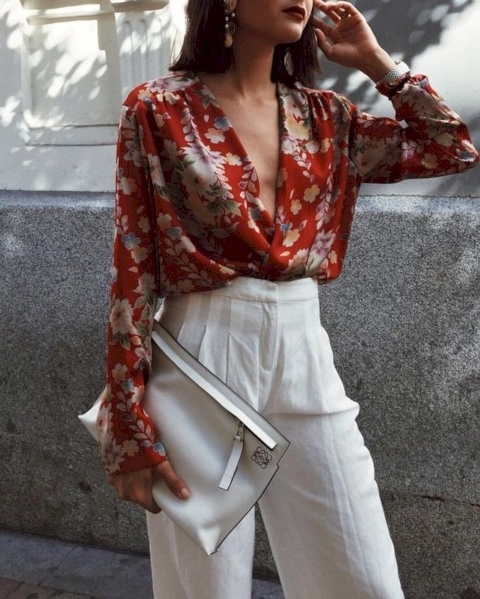 For creating a more relaxed but still elegant outfit I offer you to mix white high-waisted wide leg trousers with a white leather clutch and a red and white floral wrapped loose blouse. Wanna make a sporty chic look? 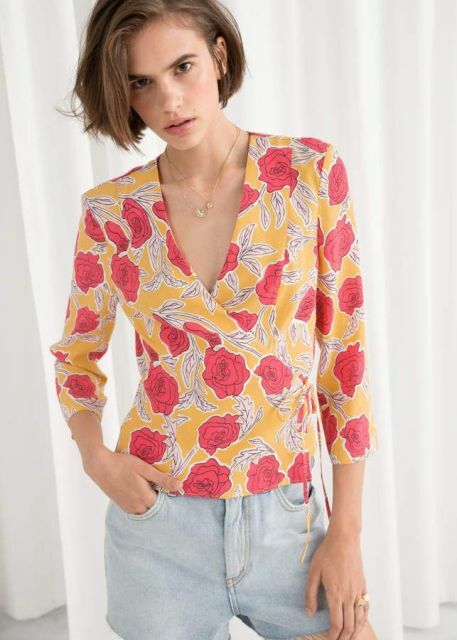 Then you can pair a floral wrapped blouse with a white t-shirt, an orange satin asymmetric midi skirt and white sneakers. 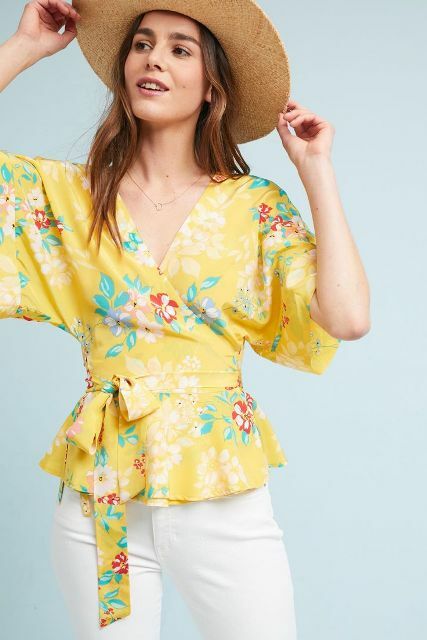 For those who want to create a cocktail party outfit, I offer to pay an attention to a pastel colored blouse, a black A-line knee-length skirt, a black clutch and black ankle strap high heels.